Timeline: The Case Against Zacarias Moussaoui Jurors in the sentencing trial for Zacarias Moussaoui have decided he is eligible for the death penalty for his role in the Sept. 11 attacks. In the next phase of the proceedings, the jury will hear more testimony and decide whether he should receive the death penalty, or life in prison. 1. Conspiracy to commit acts of terrorism. 2. Conspiracy to commit aircraft piracy. 3. Conspiracy to destroy aircraft. 4. Conspiracy to use weapons of mass destruction. 5. Conspiracy to murder government employees. 6. Conspiracy to destroy property. After seven days of deliberation, a federal jury rejects the death penalty for Zacarias Moussaoui, deciding that he will instead spend the rest of his life in prison. A French citizen of Moroccan decent, Moussaoui is the only person charged in connection with the Sept. 11 terrorist attacks. Often referred to as the "20th hijacker," he was arrested in August 2001, after raising suspicion at a flight school for requesting information on flying a 747. Feb. 26-May 29, 2001: Moussaoui trains at Norman, Okla., flight school but doesn't get pilot's license. Aug. 17, 2001: Moussaoui arrested on immigration charges after arousing suspicion at Minnesota flight school by asking to learn to fly a Boeing 747. Sept. 11, 2001: Terrorists crash jetliners into the World Trade Center, Pentagon and a Pennsylvania field. Moussaoui is moved to New York, held as material witness. Dec. 11, 2001: Moussaoui charged with six conspiracy counts related to Sept. 11 attacks. Dec. 13, 2001: Moved to Alexandria, Va., for trial. Moussaoui is denied bail. Jan. 2, 2002: Moussaoui refuses to plead; Judge Leonie Brinkema enters innocent plea on his behalf. March 28, 2002: Prosecutors announce they will seek the death penalty. April 22, 2002: Moussaoui asks to represent himself. Brinkema orders mental evaluation. 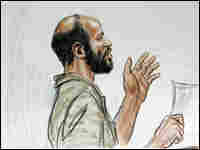 June 13, 2002: Moussaoui, who is allowed to represent himself, proclaims his innocence. Court-appointed attorneys ask to be dismissed, but Brinkema keeps them on standby. July 16-18, 2002: Prosecution revises indictment to strengthen death penalty case. Moussaoui asks to plead guilty. Brinkema gives him a week to reconsider. July 25, 2002: Brinkema rules that Moussaoui is competent to plead guilty. In a stormy hearing, Moussaoui tries to plead guilty to four counts, but Brinkema is not convinced he understands. He withdraws the pleas. Sept. 6-19, 2002: Brinkema briefly seals Moussaoui's briefs because of intemperate rants. Feb. 12, 2003: Brinkema postpones trial indefinitely. July 14, 2003: Justice Department refuses to let Moussaoui question detained al-Qaida leaders. Oct. 2, 2003: Brinkema bars the government from seeking the death penalty. Nov. 14, 2003: Citing inflammatory and unprofessional briefs, Brinkema ends Moussaoui's self-representation. April 22, 2003: A federal appeals court reinstates the death penalty as a possible sentence. Citing national security, the court says Moussaoui can use government-prepared summaries from detained al-Qaida leaders but cannot interview them. Jan. 10, 2005: Moussaoui's lawyers appeal to the Supreme Court, challenging the government's right to try him without allowing direct questioning of detained al-Qaida leaders. March 21, 2005: Supreme Court refuses to hear appeal. April 20, 2005: Brinkema meets with Moussaoui after he sends her a letter expressing desire to plead guilty. Judge deems him competent to do so. April 22, 2005: Moussaoui pleads guilty to all six charges. Feb. 6, 2006: Court begins selecting jury to choose the death penalty or life in prison. March 6, 2006: Sentencing phase begins with opening arguments. March 13, 2006: Brinkema halts testimony in Moussaoui's sentencing trial after being informed that a government lawyer, Carla Martin, shared trial testimony with upcoming witnesses, in violation of court rules. Brinkema calls the action a breach of the defendant's constitutional rights, and is considering what sanction against the government is appropriate. March 14, 2006: Brinkema decides that the sentencing trial can go forward, but without testimony and evidence key to the government's case. The judge halted proceedings the day before, warning government lawyers that they had violated her order not to coach upcoming witnesses. March 27, 2006: In a major blow to his defense, Moussaoui tells the court that he was training to attack the White House in a fifth hijacked plane on Sept. 11, and was to be accompanied on the mission by British shoe bomber Richard Reid. Under cross-examination, Moussaoui says that he did not know exactly when the attacks on New York and Washington were to take place, but that he lied to investigators after his arrest to ensure that they would be carried out. March 28, 2006: Defense attorneys scramble to undo the damage by reading testimony from senior al-Qaida operatives in U.S. custody, who describe Moussaoui as unreliable and unstable. The al-Qaida members say that they did not intend to include him in the Sept. 11 attacks. One South Asian terrorist known as Hambali, who was captured in 2003, is quoted as saying that Moussaoui had a reputation for being "not right in the head and having a bad character." In another twist, prosecutors present evidence that, in a jailhouse meeting in February, Moussaoui offered to testify for the prosecution against himself. FBI agent James Fitzgerald testifies that Moussaoui told him he did not want to die behind bars and that it was "different to die in a battle… than in a jail on a toilet." March 29, 2006: Jurors hear closing arguments in the case. March 30, 2006: The jury deciding whether Moussaoui is eligible for the death penalty asks the judge for a definition of "weapons of mass destruction." The jury is told that airplanes used as missiles are considered a weapon of mass destruction. Conspiracy to use weapons of mass destruction is one of the convictions for which Moussaoui could receive the death penalty. 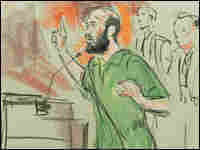 April 3, 2006: Jurors determine that Moussaoui was responsible for at least one death in the attacks of Sept. 11, 2001, and decide he should be eligible for execution. In the next phase of the proceedings, the jury will hear more testimony and decide whether Moussaoui should receive the death penalty, or life in prison. April 5, 2006: Brinkema rules that the jury may hear the cockpit recording of United Flight 93, which crashed in a Pennsylvania field on Sept. 11. April 6, 2006: Former New York Mayor Rudolph Giuliani testifies in the first day of the trial's second phase, joining Sept. 11 survivors and family members of victims. April 10, 2006: Brinkema warns prosecutors not to go overboard with Sept. 11 testimony, video footage and photographs. April 12, 2006: The jury hears the United Flight 93 cockpit voice recording. The transcript -- sans audio -- is released to the media. 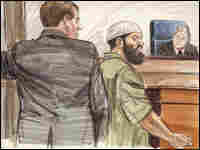 April 13, 2006: On the witness stand, Moussaoui says has he "no regret, no remorse" about the attacks of Sept. 11, 2001. April 17, 2006: A defense psychologist testifies that Zacarias Moussaoui is a paranoid schizophrenic with delusions. April 19, 2006: Half a dozen relatives of people killed in the Sept. 11 attacks testify in support of a life sentence for Moussaoui. April 20, 2006: Testimony concludes in the sentencing phase of the trial. April 24, 2006: The jury begins deliberations after the prosecution and defense present closing arguments. May 3, 2006: After seven days of deliberation, the jury rejects the death penalty, deciding that Moussaoui will spend the rest of his life in prison.